A second look at a Saturday session because I’m still trying to define “Responsive Teaching” and I saw it masterfully executed in this session. And I am still in awe. And so thankful that these readers, writers, and educators are in my life. Jan began with having us close our eyes to “Think about a teacher who loved you into being” and then having us share that story with a partner. It’s often easy to remember those who did NOT love you into being but responsiveness begins with the heart . . . Don’t rush to “check it off.” Skill and expertise has to come behind. What’s the focus if you view student work through the lens of “Love”? What’s the focus if you view student work through the lens of “Expertise”? This was the student work we viewed. Not just judging and reacting, but thinking in terms of what the student “can do”! Understands what is socially appropriate communication! Being responsive is about seeing students, understanding and responding based on the love and expertise of the teacher. Students doing the work. Teachers stepping back and admiring student work first before responding. Conferring is a path to responsive teaching, raising and following the voice of one student at a time. Using Four Quadrants – so visually appealing and helpful . . . There are many questions that fit into each of those boxes and those are available in Christina’s and Kari’s book. What is my response? It may vary . . .
And then those basic responses in a visual format. . .
What if they are coded by thought bubbles for “wonderings” or talk bubbles for “affirmations” and boxes for the notes/glueing reminders? This format could be my conferencing format. I might have 4 of these boxes on a page. Depending on our conference content, a box might hold different colored ink entrees or dates as I record the content from the conference in this format. Thinking about the application of THIS work. How does it make sense? And what a treat. Dani had examples of work in all four quadrants for a kindergarten student. Here’s an example of one kindergarten student’s “Healthy Habits” . . .
As I listened to Dani’s examples from a kindergarten level, I thought of Christina’s fifth graders. I wondered if they could complete a reflection about themselves as a reader. Christina said, “Just wait” and then she shared a fifth grade student page from which I am only sharing the book choice portion. Have teachers done this work? 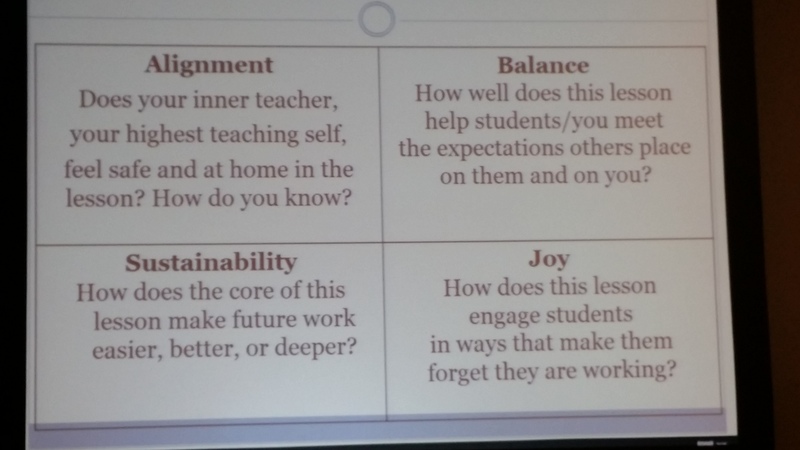 Where do teachers stand in these four quadrants? How would this move teacher confidence and competence in coaching readers forward? Responsive teaching – you will know it when you see it. It’s hard to describe but pure magic when you see it in action. Today: Being responsive is about seeing students, understanding and responding based on the love and expertise of the teacher. Conferring is a path to responsive teaching, raising and following the voice of one student at a time. The quality of professional development texts for 2016 has been amazing. One book that I continue to return to time and again to deepen my understanding is this one by Jan Miller Burkins and Kim Yaris. Twitter chats, Voxer discussions and Google docs have been the electronic formats that we’ve used for our conversations. You can review the storified chats by clicking on the links to these Literacy Lenses posts: Read Alouds, Shared Reading, and Guided Reading,and Independent Reading. You can also see connections and learning about/from this book in my previous posts here, here, and here. Some of you may have been fortunate to be a part of this group that presented at the #ILA16 Institute “Who’s Doing the Work? last Friday or been in the audience to see the presentation. YOU HAVE MISSED SO MUCH LEARNING! I’m not saying that you have to do all three of those but if you are a teacher of reading or writing, you must be doing some reading and writing in the summer. Learning is both efficient and effective when it includes collaborative study with peers. I still have to do the work and wrestle with my own understanding, but then I also appreciate hearing other perspectives from colleagues and coworkers. Here are just a few samples from my work with understanding this book! These are some excerpts from my writing about my reading! Write a paragraph that uses five or more of the words listed below and is related to teaching reading. Before Reading: Readers need to read in order to grow and develop as readers. Answering a barrage of questions as before, during , and after reading does not make them better readers. 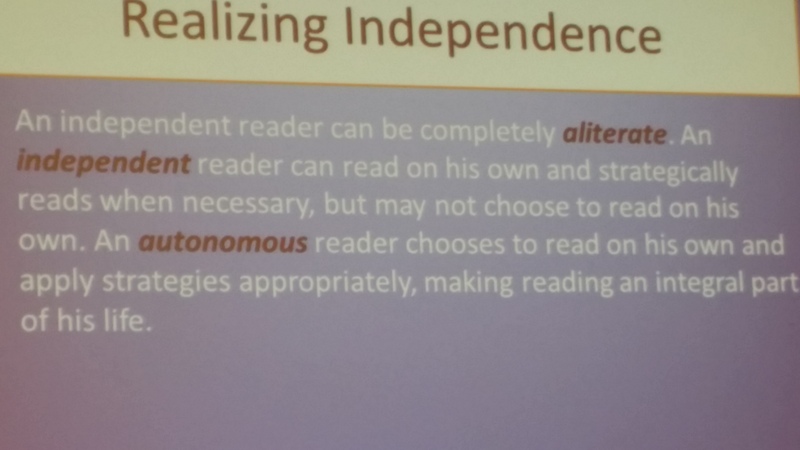 The right amount of instruction matched with the right texts will build independent readers who can and do read. Before Reading: Reading level only tells you approximately what level text the student was last successful on. That letter or number doesn’t tell anything about the reader and what they CAN do! After Reading: I am so fascinated by the fact that these two sentences followed each other in the text. All 3 cueing systems need to be firing simultaneously (like all pistons in an engine) in order to efficient, effective reading. Instruction can’t be parsed out and over-focused on any one element! (quote 2) All three readers had same letter but different issues. The level is only one piece of the data puzzle. It’s not the end game. Before Reading: The student is a product of all instructional contexts so each, ind. Reading – read-aloud, are important to his/her development. Those contexts help build the “want to read” motivation so that students are successful later! Before Reading: Reading level is limiting – reading processes open up the universe to the student! Process will help focus on what the student is capable of and will provide the information needed to keep the student moving forward. Reading is not about a certain % to pass a leveled book test. After Reading: Fascinating, again, that these two sentences were also back to back in the text. Balance in reading processes requires a balance in instructional contexts that creates the internal motivation to read/learn . . that want to read. 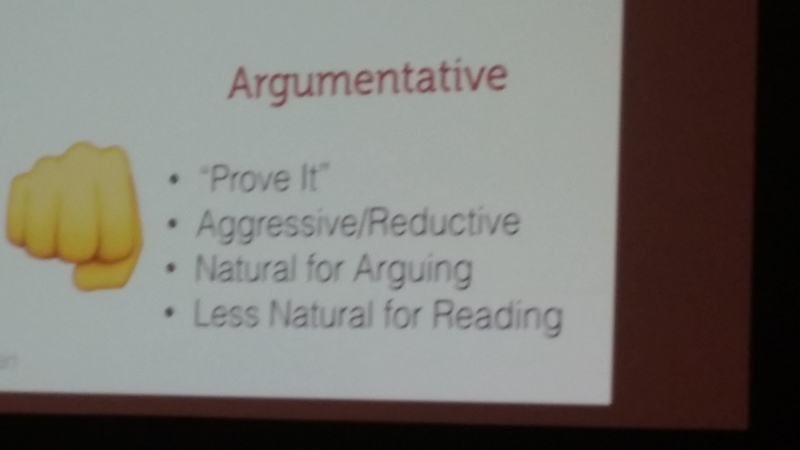 And when you focus on reading process (within GRR), your teaching will be changed forever!!! Choose from these words to create a poem. Which words would you choose? What would your poem look like? What would be your evidence of learning? How do you work on your learning? Low Tech would be paper, pencil, markers, notes . 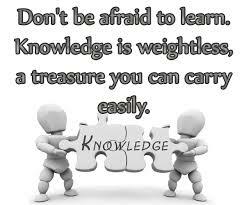 . .
What’s your evidence of learning / thinking? Thank you, Betsy, Beth, Dana, Deb, Kathleen, Lisa, Melanie, and Stacey for this weekly forum. Check out the writers, readers and teachers here. The hardest step is the first step of your learning journey! 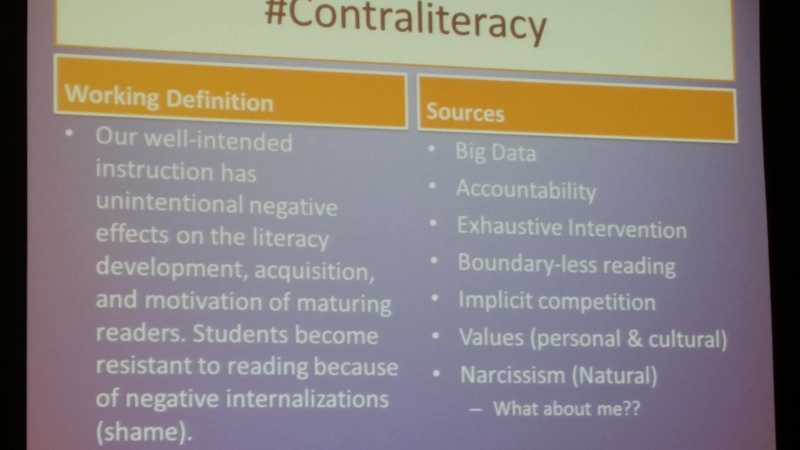 This weekend the Twitter stream provided many insights about Literacy, Literacy Instruction, and “Intent”. A powerhouse line up was present at the New England Reading Association conference (#NERA2016) in Portland, Maine. You can see the speakers and topics here. This post celebrates the Twitterverse that allowed me to curate these ideas from afar. At #NERA2016 Saturday, Matt Glover and Kathy Collins proposed this expansive definition. Many questions immediately came to mind. Who does the work of reading? What is the intent of reading? What does this require of a teacher? This quote from @chrisclinewcps says so much about some of the characteristics of “INTENT”! At the opening session of #NERA2016, Ralph Fletcher fired an early shot across the bow with this slide. Think about these three questions as you read the content on his slide. What is the message for teachers? What is the message for students? As a reader, what was Ralph Fletcher’s message? Is choice just for students? Is choice also for teachers? 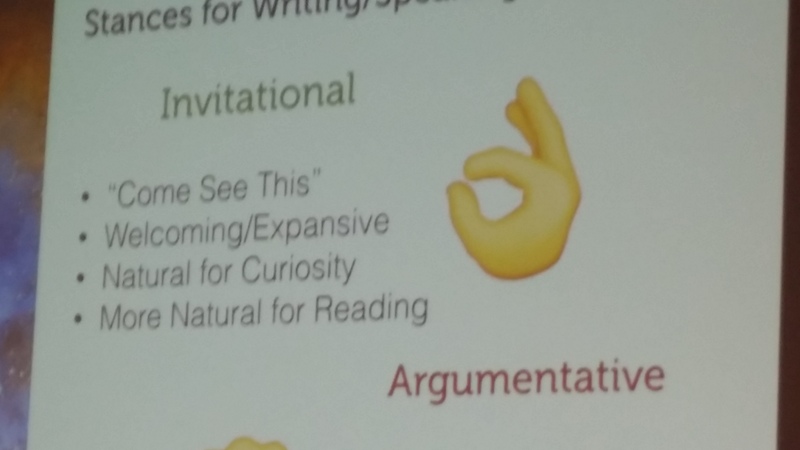 What does this mean in writing? Paula also tweeted out this learning from Jeff Anderson (@writeguyjeff) about the role of grammar in writing. Is the intent to have students do the work? Are students doing the thinking? Dan Feigelsen is crystal clear in his intent. Her May blog post here addressed specific steps to create writing communities. How do your students know the intent of your writing instruction? Empowering students to do the work is the basis of Jan and Kim’s book. If you have not yet checked out this book, you need to do so! According to the educator John Holt, “Learning is not the product of teaching. Learning is the product of the activity of learners.” And in this interactive session, Vicki Vinton will share ways of ensuring that the activity of students and their thinking—versus curriculum and standards—are at the center of your reading instruction, whether you’re working with a whole class, a small group or one-on-one conference. You’ll see how to become a creator of learning opportunities, rather than a teacher of strategies and skills, which in turn will help students become powerful and insightful meaning makers, thinkers and readers. The intent of “student-centered reading instruction” is for learning to be at the center of student work. How do you work towards this every day? What do you notice as a reader? What do you DO with / or make of what you noticed? Because the intent is reading deeply, thoughtfully, and authentically! Check out other thoughts about “intent” on #DigiLit Sunday with Margaret Simon here. And special thanks to all who tweeted from #NERA2016 and especially to their Twitter Ambassadors: @LitCoachLady, @literacydocent and @guerrette79. #SOL16: What are you planning to read? New professional books in the field of literacy are headed your way this spring from the following authors: Stacey Shubitz; Jan Miller Burkins and Kim Yaris; Kate and Maggie Roberts, Dana Johanson and Sonja Cherry-Paul; and Doug Fisher, Nancy Frey and John Hattie. Get ready for some amazing learning! Stacey, Two Writing Teachers, has this book out from Stenhouse this spring: Craft Moves: Lesson Sets for Teaching Writing with Mentor Texts. Stacey blogged about her book here. Coming later this year a new book from Vickie Vinton . . . Waiting is so hard . . . sometimes waiting on “new friends” is harder than waiting on Christmas. What books are on your professional reading list? Do you share “your reading plans” with your students? 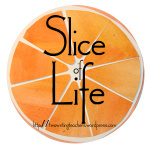 Tuesday is the day to share a “Slice of Life” with Two Writing Teachers. Thank you, Anna, Betsy, Beth, Dana, Deb, Kathleen, Stacey, and Tara. Check out the writers, readers and teachers here. Get ready to share your writerly life in one week with the March Slice of Life Challenge! The talented and amazing Kim Yaris (@kimyaris of @burkinsandyaris) took us on a whirlwind tour of books and classrooms for fifty minutes of FREE learning via Chris Lehman’s (@ichrislehman) Education Collaborative free online PD all day Saturday, September 19th. Here’s a brief glimpse of some of the characteristics that Kim showcased! Check out Kim’s session here! So much to think about as you make sure that you have a supportive learning community in your classroom/building! It’s not too late to follow along live (or later). 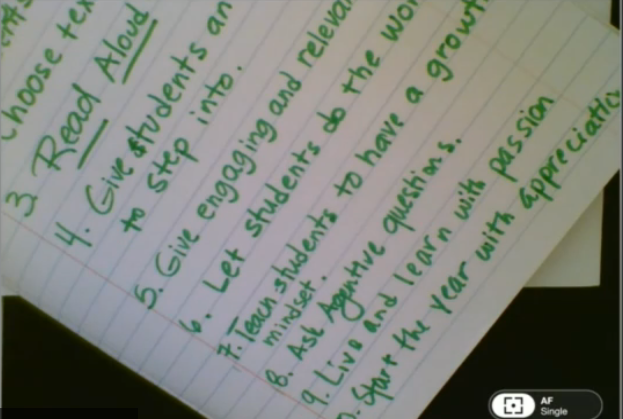 Here is the agenda for #TheEdCollabGathering! 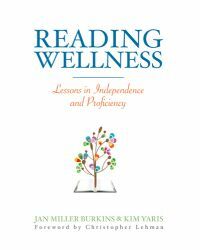 Are you familiar with Jan and Kim’s book, Reading Wellness? Their blog? 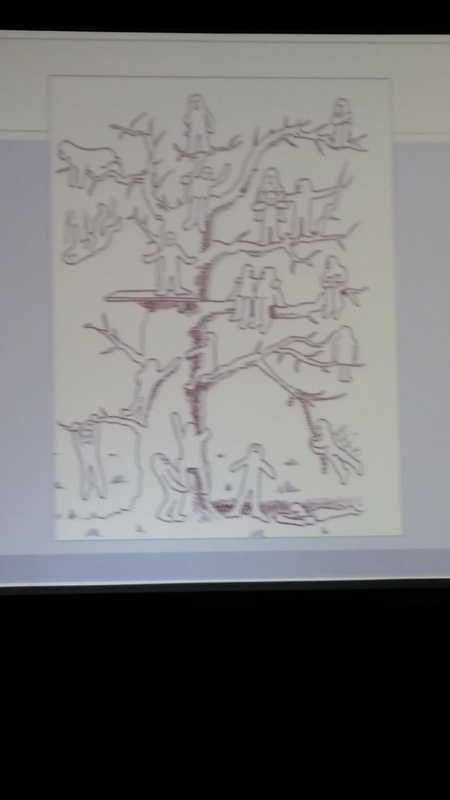 What learning treasures did I find on a Sunday in St. Louis at #ILA15? I find Justin’s work with #contraliteracy to be fascinating. The sources are common. These “unintended negative effects” surround students, especially at the middle school age who are already both hyper-sensitive and hyper-critical of themselves and any “perceived’ slights. How do we move beyond the many faces of shame? 1. Build Relationships with our readers. Admit, Acknowledge and Absolve them of past practices. 2. Use Self-Perception Scales to help students understand their own perceptions. 3. Have students tell their reading histories. Listen for the patterns. Define what students can control – when and where can they find minutes to read? One strategy that Justin has found to be successful for his readers is 30 Books in 30 Days Read Alouds. This promotes intimacy, relationships with characters, and connections with life as students practice strategies, form opinions, discover new interests and allows some above grade level reading. Because I love their book, Reading Wellness, this session was an automatic choice as soon as I saw the #ILA15 program! From the opening, “What are you on about?” to our ending dance, this session was absolutely FUN learning! Which character in the picture is most like you? The whole concept of “Lean in, Lean Out” was explored with some adult pictures as well as student pictures. More information in their book, Reading Wellness: Lessons in Independence and Proficiency. As we moved on, Jan modeled the thinking from a Heart, Head, Hands, and Feet lesson using Ken Robinson’s The Element. The real learning came when we partnered, read a picture biography and created a “Heart, Head, Hands, and Feet” drawing for our book. What a fun way to REALLY provide hope, inspiration and the power of positive thinking for career choices for students. There truly are actions that students can begin to take NOW to more fully explore possible careers. Take Away: Biographies need to be carefully chosen to include childhood actions and balance of the four elements (alignment, balance, sustainability, and joy) is critical. Just go to www.burkinsandyaris.com to see more information about “HHHF” lessons! It will be time well spent! I first met Chris Lehman at a 50 minute closing workshop during a Teachers College summer institute so I know just how much compelling information he can pack into an hour. And WOW! What a lesson in “passionate” reading, writing, viewing, speaking, and listening! to a more invitational stance? This invitational stance can still be persuasive and/or meet the requirements of claim, evidence, etc of the grade level standards in CCSS.W.1. The writing from this stance will be much more interesting while providing compelling information for the reader. Chris provided the opportunity for us to practice using this invitational stance with a topic of our own choice or the topic of Pluto that he introduced us to in the opening minutes of the session. The stance carried over into sources as well. “What is it like to have a conversation with a source when you feel something about the topic/text?” Do we provide that opportunity for students? The whole idea of “reading with someone in mind (to share the information with later) led to some LOUD partner practice in a jam-packed room. Curiosity. Passion. Interest. Not copying. Not plagiarizing. And then some masterful thinking about the “source” of information. “Teach appositive phrases, which is what this is, to students. Chris modeled this by describing his friend Barb who taught him about Bitmoji. Knowing a bit more about the background of the source in the introduction changed the whole tone of the piece. Check this example out! That was just one sentence but think of the context, tone, mood and information that was conveyed. Was this “copied” from a book? If you need more ideas about research, you won’t go wrong with Chris’s book, Energize Research Reading and Writing: Fresh Strategies to Spark Interest, Develop Independence and Meet Key Common Core Standards, Grades 4-8 and you can read an excerpt here. Take Away: Be passionate about learning and writing and move writing to an invitational stance that shows students how authors provide facts and information about sources without “copying”! Is “metacognition” just a buzz word? The National Academy of Sciences in their report “How Students Learn” said that the key to effective learning, after 600 pages of research findings, was metacognition. John Hattie lists metacognitive strategies as 14th out of 138 influences on achievement and Marzano says that metacognition is the “mission control” of the thinking process. Metacognition is more than just a buzz word and in fact, is necessary for students to be reading writing, speaking, listening, and thinking at high levels. With instruction and time for practice, students in even the primary grades can learn about metacognition and practice their thinking skills. It may look gimmicky at first, especially if the teacher dons a “thought bubble” to model and show their thinking to students. Talk, sketching, images, video, the use of complex text – all of these can be used to enhance thinking and reflection for our students. Take Away: Students can use a silhouette of a head with a “brain-shaped” space to write their thinking to emphasize that it comes from the brain! Are you a middle school or high school teacher? Do you work with middle school or high school teachers? Do you know Dave Stuart? His blog? His “Non-Freaked Out Approach to the Common Core? This hour spent with Dave was an hour of pure gold and many, many ideas to consider about both the volume and the quality of literacy activities, reading, writing, speaking, and listening, across the day for students in middle schools and high schools. What, in one sentence, is your ultimate goal for students? 3. Every kid needs to speak. 6. Teach and assess 1-2 skills at a time. I especially found his three types of writing to be helpful when thinking of ELA and Content Teachers. More conversation about the purpose of writing (to solidify or extend learning) could make this less “threatening” for content area teachers. TAKE AWAY: Debates and more writing can help build thinking and communication skills that will transfer to real-world success! What “Treasures” did you find today? What thinking / ideas do you want to carry forward into the next school year?